Have kids to entertain? Look no further than the ABC Family Kodi addon. You’ll be able to enjoy a full menu of ABC Family Channel programming online, in HD. 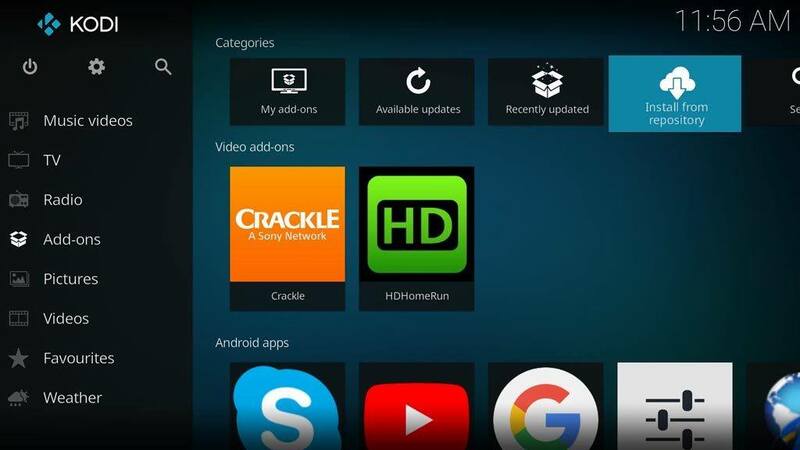 The Crackle Kodi addon is owned by Sony Pictures Entertainment, so you know it’s great! This streaming distributor offers an outstanding lineup of entertainment including movies, TV shows, and original web shows. Watch all you want! Get a mixture of video clips, livestreams, movies, TV, and music with the Daily Motion Kodi addon. It’s sure to be a favorite! If you want to watch popular movies and TV shows free online, take a look at the Filmrise Kodi addon. the collection is vast, and streaming is unlimited. Get your fix. The Reddit Kodi addon lets you watch all the videos you want from reddit.com. An autoplay feature adds convenience. For all things indie, look no further than the Sundance TV Kodi addon. This free addon is fantastic – it’s full of independent films, original TV series, and much more. If you like content that centers around motorsports, outdoors activities, and adventure in general, then you’re probably going to be a huge fan of the TuffTV Kodi addon. Movies and some team sports content add extra value to this free addon. Gamers, this one’s for you. The Twitch Kodi addon lets you watch your favorite gaming livestreams. Enjoy! Love video sharing sites? Then you’re going to enjoy the Kodi Vimeo addon. It provides full access to everything on Vimeo at no charge. If you’re a fan of YouTube, this addon is a must-have. The YouTube Kodi Plugin combines the power of Kodi with the endless stream of entertainment found on the world’s most popular video sharing site. Before we get started with addons, we’d like to remind you that the right VPN can make a huge difference in streaming quality while protecting your privacy and helping you get around aggravating geographic blocks. For a few dollars per month, a virtual private network prevents your ISP and others from snooping, throttling, and censoring. If you don’t already have a VPN, you’re going to want to take a second to check out this guide to the best VPNs for Kodi. Get everything the British Film Institute has to offer free with the BFI Player Kodi addon. This interface makes it easy to access BFI’s online content. You aren’t going to find the latest blockbusters here, but if you’re a fan of old movies and TV shows, then you’re probably going to enjoy the Classic Cinema Kodi addon. Get the popcorn! Action? Drama? Comedy? Romance? The Popcornflix Kodi addon has something for everyone. If you want to watch movies online, you’ll probably enjoy this free, legal addon. Free movies online? Yes, please! The Snagfilms Kodi addon gives viewers instant access to a library of hundreds of movies, all neatly categorized by genre. There are some TV shows here, too. Whether you want to listen to the oldies, enjoy the latest hits or tune in to something in-between, you’re likely to enjoy the 100FM Radius Digital Kodi music addon. There’s nothing here but music! Get access to the world’s most extensive online music catalogue with the LastFM Tube Kodi addon. Watch your favorite videos or let them play in the background. If you like music, podcasts, and radio shows, then the Kodi Plugin for MixCloud is a fantastic addon to consider. All content is available on demand. Editorial content and original music programming makes the NPR Music Kodi addon ideal for those who want something other than mainstream music content. Whatever your favorite genre, you’re likely to find new, intriguing tunes here. Looking for something different? Check out the Radio Kodi addon. This plugin gives you access to over 7000 live radio broadcasts from all over the world, all neatly arranged by genre, location, city, language, topic, and more. The BBC iPlayer WWW Kodi addon is an interface to BBC’s iPlayer website. While it isn’t affiliated with BBC, it lets you play live TV from the UK while getting full access to BBC’s radio content. This addon isn’t just great for news, it’s also a good source for entertainment. Get instant access to all the latest content from CNN, 24/7. The CNN Kodi addon is searchable, with deep archives that provide the backstories behind current events. Mainstream news is everywhere. The Films for Action Kodi addon is a great alternative, with a focus on environmental and social issues that impact your life. If you want a deeper understanding of what’s happening in the world, this is an excellent source of information. Get the best content from one of the UK’s best video sharing sites, and don’t pay a cent. If citizen journalism appeals to you and you’d like coverage from a new perspective, then you don’t want to miss out on the LiveLeak Kodi addon. Looking for local news online? The NewsON Kodi addon gives you instant access to live and on-demand broadcasts from 114 markets across the US. Currently, there are 175 local channels to choose from. No cable or satellite subscription is required for this free addon. The Apple iTunes Podcasts Kodi addon features 60 genres and allows you to search for your favorite podcasts by name. There are thousands of free audio and video podcasts to choose from, and you don’t have to have iTunes to partake. Get full access to NASA’s vodcasts, livestreams, and videos with the NASA Kodi addon. Whether you’re curious about the cosmos or interested in viewing earth from space, you’ll find this addon fascinating. If you love brainy content and you’re a fan of NPR’s Science Friday with Ira Flatow, then you’ll find the Science Friday Kodi addon positively addictive. Listen to it like a podcast or watch videos. There’s an endless stream of smart, entertaining stuff meant to feed your brain on this addon, and we’re pretty sure that you’ll love everything about it. Fans of This American Life are sure to enjoy the Serial Kodi addon. True stories come to life, chapter by chapter. Be sure to listen in order! If you want to watch ESPN online without paying for a cable subscription, then you’re probably going to like everything about the ESPN 3 Kodi addon. You’ll have access to a full menu of live-streamed events, slong with replays and more. Astonishingly, this ESPN Kodi addon is free. You need a free ESPN.com account to get started. Watching baseball online has never been easier. The MLB.TV Kodi addon streams regular season games out of market, plus there’s plenty of other baseball-related content to keep you entertained. Some features are paid; others are free. Want to watch basketball online? Look no further. The NBA League Pass Kodi addon gives you front row seats to live streamed games along with highlights, full archived games, top plays, condensed games, and a whole lot more. You’ll need a subscription to NBA International League Pass if you want to watch. The NFL.com Kodi addon is a free, legal way to get your football fix online. While there are no streaming games, there’s tons of content to keep you entertained and informed. If you’re looking for a good way to watch extreme sports online, your search has come to an end. The Red Bull TV Kodi addon gives you wings, allowing you to watch live events and tons of pre-recorded content. This addon is free, and it’s totally legit. Live sporting events are a mainstay of the Sportsnet Now Kodi addon. Watch hockey online, view baseball games, or watch American football games. You need a valid Sportsnet subscription for this addon, and it’s geo-restricted to Canadian viewers. The good news is that a good VPN can help you get around the location censors. Laughter is the best medicine! The Comedy Central Kodi addon has you covered at no charge, with a full lineup of hit shows, standup, and a whole lot more. Love the Cooking Channel? Watch full episodes of your favorite shows with the Cooking Channel Kodi addon. It’s free, mouthwatering fun. Get your DIY fix! The DIY Network Kodi addon gives you access to plenty of free content. Whether you’re into crafts, gardening, or home improvement, this addon is sure to please. Speaking of mouthwatering, the Food Network Kodi addon is another delicious choice. Get inspiration for your next meal and enjoy a wide range of the channel’s content for free. If you’re a fan of the HGTV network, then you’ll enjoy the HGTV Kodi addon. There’s tons of free content to watch including full episodes of your favorite HGTV shows. Got kids? Get the PBS Kids Kodi addon. This is a favorite, thanks to a broad mixture of animated and live action children’s programming that provides entertainment with an educational twist. With a vast range of current and classic programming, the PBS Think TV Kodi addon brings thoughtful content your way. Enjoy! It may not be traditional network television, but the Pluto TV Kodi addon brings more than 100 channels your way. There’s news, sports, cartoons, classic TV shows, and a whole lot more to choose from. You have to pay for content you watch with the PS Vue Kodi addon, but it’s a whole lot cheaper than a cable or satellite subscription. Order channels individually, or treat yourself to a multi-channel plan. The Playstation Vue Kodi addon doesn’t lock you into a contract and you can cancel anytime you like. Satisfy your wanderlust with the free Travel Channel Kodi addon. Travel guides, videos, and full episodes of your favorite Travel Channel shows are among the highlights. Free TV classics are yours with the TV Land Kodi addon. Watch full episodes, see popular clips, and more. If you’re looking for a free, legal Kodi TV addon that won’t land you in hot water, you’re probably going to like everything about this one. The USTVnow Kodi addon offers lots of free content, a built-in DVR, and additional options with a paid upgrade. There are many popular channels to choose from! Want to watch ABC online? The WABC Programs Kodi addon has you covered with live programming from ABC’s flagship station in New York City. Not only is this one of the best Kodi addons in 2019, it’s totally legit. Best of all, it’s free! If you want to watch NBC live online, the WNBC Programs Kodi addon is going to be one of your favorites. This addon is free and legitimate, with a full lineup of streaming NBC shows from WNBC New York. Never heard of Zattoo? You’re missing out! The Zattoo Box Kodi addon provides access to live TV from Europe. It’s free, but you need to register for a Zattoo account to get started with the addon. Looking for the perfect Kodi skin? We really like this one for its clean, well-organized design. Best of all, the Andromeda Kodi addon is optimized for full HD TV screens, so you get a superbly crisp view. There are lots of options when it comes to choosing the best web interface for Kodi. This one is very popular, as it helps you discover new content online, and it works with the device of your choice. The Arch Kodi addon also helps you browse through your music, TV, and movie content with ease. If you use Google Drive, then you’re going to want the Google Drive for Kodi addon. While it isn’t affiliated with Google, this addon does provide access to everything you’ve stored on your Drive, including photos, music, and videos. The HDHomeRun Kodi addon features a great TV guide with an episode guide built in, along with a DVR for recording and watching your favorite shows. It automatically finds compatible devices on your network, delivers whichever channels are available, and treats you to all the TV you can handle. Stop wondering what to watch. The LazyTV Kodi addon automatically surfaces the next episode of your favorite show. You can also use a function that helps you channel-surf your library faster, so your free time is spent watching instead of searching. If you’re interested in recording original sounds and sharing them with the world, then you’re going to love what the Soundcloud Kodi addon can do for you. Try it for recording, uploading, sharing, and even promoting the music, podcasts, and recordings you make. Get organized! The Super Favourites Kodi addon helps you organize all of your menus, create sub folders, and more. This addon puts an end to wasted time spent searching for the content you want. So many great add-ons ! How do i put the mostly all on at the same time and scroll or search for stuff.